SHHH … WE LOVE MEETINGS! We love meetings that are well designed, encourage full engagement and drive to your outcomes! So if you are tired of sitting in meetings that never seem to generate real change, then it is time to give us a call and let us design and facilitate your next event. 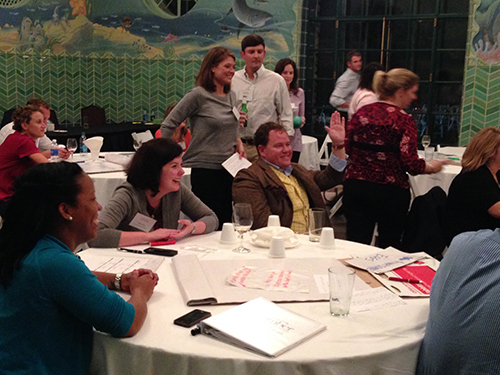 Continuum Consulting specializes in designing fun, interactive and results-oriented meetings, retreats and summits. We will partner with you to define your meeting objectives and design an agenda that drives to desired outcomes. Consider utilizing an Appreciative Inquiry process or Graphic Facilitation for your upcoming meeting. Wendy engaged us in rigorous dialogue and interactions during the retreat, resulting in our very first Strategic Plan. She masterfully led and supported us through the co-creation process, generating a variety of possibilities and then helped us synthesize it all into our Bold Steps Plan. We could not believe how much we accomplished in such a short time and how much fun we had doing it. The Strategic Plan has afforded us growth, profitability and deep fulfillment. Thanks Wendy! Appreciative Inquiry is a collaborative, strength-based approach to team development, innovation and strategic change initiatives. It is both a process and the philosophy that informs all the work we do with clients. “AI is an exciting way to embrace organizational change. Its assumption is simple: Every organization has something that works right – things that give it life when it is most alive, effective, successful, and connected in healthy ways to its stakeholders and communities. AI begins by identifying what is positive and connecting to it in ways that heighten energy and vision for change. …AI recognizes that every organization is an open system that depends on its human capital to bring its vision and purpose to life. … The outcome of an AI initiative is a long-term positive change in the organization. … AI is important because it works to bring the whole organization together to build upon its positive core. The AI Summit is a highly interactive, large-scale, group engagement process focused around a specific topic that is deeply important to the organization. Sample Summit topics include: strategic planning, innovation, building collaboration, creating your corporate vision and mission and launching new initiatives. Your 2- to 3-day event is designed around the 4-D process of Discover, Dream, Design and Deliver. 85% of the people in your meetings are visual learners. Today we are continually bombarded with information. We need a new way to process ideas and concepts and capture collective thinking. 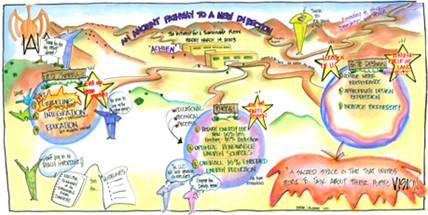 We encourage all of our clients to add graphic facilitation to their meeting process. Read more to discover how best to utilize this facilitation process! Imagine your meetings and conferences coming to life before your eyes – we’re talking REAL TIME! Thoughts and ideas are captured in living color on the walls around the room as the conversations emerge. We’re not talking flip charts! Imagine words that combine with images to capture key conversations, decisions, concepts and new ideas. A PICTURE IS WORTH A THOUSAND WORDS. If this is true, a simple elegant image has ROI written all over it, especially if you can “unpack” the experience and TELL THE STORY all the way through your second-tier audiences. We take your ideas out of the realm of conversation and transfer them into creative visual images. The intent is to capture the essence of the discussion and the specific points, statements and agreements in a graphic format. The output of each process is large, illustrated “maps” that you can use to “unpack the conversation” at a later time. This visual method is a powerful tool that assists learning and communication between groups and individuals. It creates a bridge between meeting decisions and accurate execution.